The use of echocardiography as an imaging modality has increased substantially over the past decade. Cardiologists perform most echocardiography studies, with internists being the next most common providers of these studies (15% of all Medicare charges submitted for the procedure). The objective of this article is to provide clinicians with a brief review of basic principles and instrumentation of echocardiography. Neither bone nor air is a good transmission medium for ultrasound waves; accordingly, specific windows (eg, apical, parasternal, subcostal, and suprasternal) are used to image the heart. Two-dimensional (2-D) echocardiography provides real-time imaging of heart structures throughout the cardiac cycle; more recently, 3-dimensional (3-D) echocardiography has been developed. Doppler echocardiography provides information on blood movement inside cardiac structures and on hemodynamics. Tissue Doppler imaging (TDI) provides information about movement of cardiac structures. The relation between the dynamics of cardiac structures and the hemodynamics of the blood inside these structures provides information about cardiac diastolic and systolic function. Echocardiography is continuously evolving and constantly being augmented by newer modalities, such as tissue harmonics, speckle tracking, tissue Doppler strain, and tissue characterization. 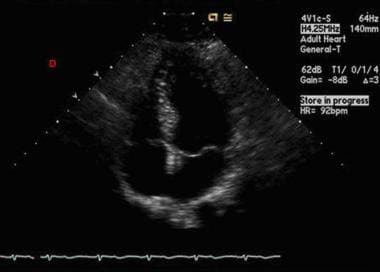 These phenomena are the basis for many of the clinical applications and calculations of echocardiography. Interaction of ultrasound waves with tissue results in reflection, scattering, refraction, and attenuation of the waves. 2-D echocardiographic imaging is based on reflection of transmitted ultrasound waves. Doppler analysis is based on the scattering of ultrasound waves from moving blood cells, with a resulting change in the frequency of the waves received at the transducer. Attenuation limits the depth of ultrasound penetration. Refraction, a change in the direction of the ultrasound wave, results in imaging artifacts. Wavelength has clinical importance, in that image resolution cannot be greater than 1-2 wavelengths. That is to say, the higher the frequency, the shorter the wavelength and the better the image resolution. The depth to which ultrasound waves penetrate the body is directly related to wavelength (ie, shorter wavelengths penetrate a shorter distance). The depth of penetration for adequate imaging tends to be limited to about 200 wavelengths. Thus, an obvious tradeoff exists between image resolution and depth of penetration. Thus, a 1-MHz transducer has a penetration depth of 30 cm and resolution of 1.5 mm, whereas a 5-MHz transducer has a lesser penetration depth, only 6 cm, but a higher resolution, approximately 0.3 mm. 2-D imaging depends on reflection of ultrasound waves. These waves are reflected at tissue boundaries and interfaces, with the quantity dependent on the relative change in acoustic impedance (ie, density) between the 2 tissues. Optimal return of reflected ultrasound waves occurs at a perpendicular angle (90°). Doppler flow imaging depends on the scattering phenomenon, and its optimal flow angle is the opposite of that for 2-D imaging (ie, parallel to the flow of interest, rather than perpendicular). The Doppler effect may be simply stated as follows: A person moving toward a sound source will hear a tone with higher frequency than the emitted wave frequency, whereas a person moving away from the source of sound will hear the tone with a lower frequency than the emitted wave frequency. M-mode image across aortic valve as well as left atrium plotted against time. Color Doppler image across mitral valve shows evidence of mitral regurgitation; color Doppler scale shown on left indicates Nyquist limit. Echocardiography has no contraindications. It should be kept in mind, however, that this modality may yield only limited information in patients at the extremes of adult body weight, because a thick chest wall (in markedly obese patients) or overcrowded ribs (in severely underweight patients) may limit the penetration of ultrasound waves. Pearlman AS, Ryan T, Picard MH, Douglas PS. Evolving trends in the use of echocardiography: a study of Medicare beneficiaries. J Am Coll Cardiol. 2007 Jun 12. 49(23):2283-91. [Medline]. Ryan T, Armstrong WF, Khandheria BK. Task force 4: training in echocardiography endorsed by the American Society of Echocardiography. J Am Coll Cardiol. 2008 Jan 22. 51(3):361-7. [Medline]. Burwash IG, Basmadjian A, Bewick D, Choy JB, Cujec B, Jassal DS, et al. 2010 Canadian Cardiovascular Society/Canadian Society of Echocardiography Guidelines for Training and Maintenance of Competency in Adult Echocardiography. Can J Cardiol. 2011 Jul 26. [Medline]. Otto C. Textbook of clinical echocardiography. 2nd ed. Philadelphia, Pa: WB Saunders Co; 2000. Cheitlin MD, Armstrong WF, Aurigemma GP, Beller GA, Bierman FZ, Davis JL. ACC/AHA/ASE 2003 Guideline Update for the Clinical Application of Echocardiography: summary article. A report of the American College of Cardiology/American Heart Association Task Force on Practice Guidelines (ACC/AHA/ASE Committee to Update the 1997 Guidelines for the Clinical Application of Echocardiography). J Am Soc Echocardiogr. 2003 Oct. 16(10):1091-110. [Medline]. Douglas PS, Garcia MJ, Haines DE, Lai WW, Manning WJ, Patel AR, et al. ACCF/ASE/AHA/ASNC/HFSA/HRS/SCAI/SCCM/SCCT/SCMR 2011 Appropriate Use Criteria for Echocardiography. A Report of the American College of Cardiology Foundation Appropriate Use Criteria Task Force, American Society of Echocardiography, American Heart Association, American Society of Nuclear Cardiology, Heart Failure Society of America, Heart Rhythm Society, Society for Cardiovascular Angiography and Interventions, Society of Critical Care Medicine, Society of Cardiovascular Computed Tomography, a... J Am Coll Cardiol. 2011 Mar 1. 57(9):1126-66. [Medline]. Nash P, Lin S, Armstrong G. Transthoracic echocardiography. Griffin B, Topol EJ. Manual of cardiovascular medicine. 2nd ed. Philadelphia, Pa: Lippincott Williams & Wilkins; 2004. 780-815. Feigenbaum H. Echocardiography. Braunwald E. Heart Disease: a Textbook of Cardiovascular Medicine. 5th ed. Philadelphia, Pa: WB Saunders; 1997. 53-97. Pellerin D, Sharma R, Elliott P, Veyrat C. Tissue Doppler, strain, and strain rate echocardiography for the assessment of left and right systolic ventricular function. Heart. 2003 Nov. 89 Suppl 3:iii9-17. [Medline]. Marwick TH. Measurement of strain and strain rate by echocardiography: ready for prime time?. J Am Coll Cardiol. 2006 Apr 4. 47(7):1313-27. [Medline]. Kirkpatrick JN, Vannan MA, Narula J, Lang RM. 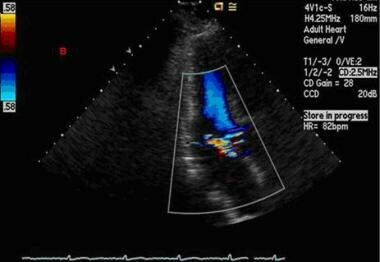 Echocardiography in heart failure: applications, utility, and new horizons. J Am Coll Cardiol. 2007 Jul 31. 50(5):381-96. [Medline]. Weyman AE. The year in echocardiography. J Am Coll Cardiol. 2009 Apr 28. 53(17):1558-67. [Medline]. Thomas JD, Adams DB, Devries S, Ehler D, Greenberg N, Garcia M, et al. Guidelines and recommendations for digital echocardiography. J Am Soc Echocardiogr. 2005 Mar. 18(3):287-97. [Medline]. Thomas JD. The DICOM Image Formatting Standard: what it means for echocardiographers. J Am Soc Echocardiogr. 1995 May-Jun. 8(3):319-27. [Medline]. Mulvagh SL, Rakowski H, Vannan MA, Abdelmoneim SS, Becher H, Bierig SM. American Society of Echocardiography Consensus Statement on the Clinical Applications of Ultrasonic Contrast Agents in Echocardiography. J Am Soc Echocardiogr. 2008 Nov. 21(11):1179-201; quiz 1281. [Medline]. 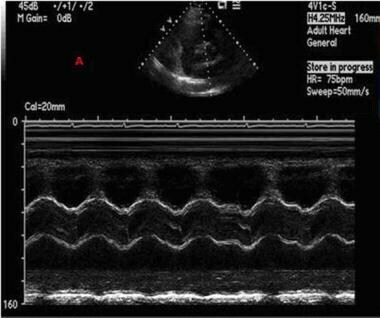 Spectral Doppler image of mitral valve inflow. The views expressed herein are those of the author and do not reflect the official policy or position of Brooke Army Medical Center, the US Army Medical Department, the US Army Office of the Surgeon General, the Department of the Army, Department of Defense, or the US Government.